If you’re someone who likes to write – whether it’s in a journal or just taking notes, you know that sometimes if you’ve been writing a lot, your hand can feel cramped and the writing gets more and more uncomfortable. There are lots of “ergonomic” pens on the market, but not all of them are designed by a physician specifically to help create a easier, more comfortable pen. Everyone and anyone can benefit from using Dr. Lee’s Ultimate Grip Pen. The UGLee Pen was designed for every hand, from big to small. It doesn’t matter if you write all day or if you only write for five minutes a day. After using the Ultimate Grip Pen by Dr. Lee, you will never want to use another pen again. There are a few things that make the UGLee Pen unique and a very comfortable, ergonomic writing tool. First, the grip actually grips you, instead of you having to grip the grip. Other pens with rubbery grips seem to be smooth pieces of soft plastic with ridges. With the UGLee Pen, the grip is made of a ballistics grade nylon which actually grips your fingers without being sticky. I held two “grip” pends in my hand – the first easily slid between the fingers while the UGLee Pen gripped firmly. The other difference with the UGLee pen is the ink. While there are a lot of different inks on the market, from gel to rollerball to fountain, What I noticed was that with the UGLee pen, it felt like I was writing on the softer surface. I compared the writing of an UGLee pen to another ball point pen and one gel pen. In both cases I could feel the hard surface of the desk. With the UGLee pen, the ink was smooth and it felt like I was writing on a softer surface – almost like when you have a couple of sheets of paper underneath. The ink used is actually a cross between gel and ballpoint, helping to create a smooth writing experience. 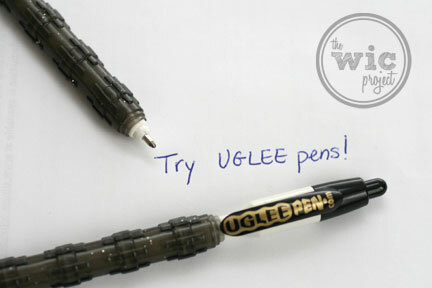 If you are looking for a comfortable, ergonomic pen, you can purchase UGLee pens from UGLeePen.com. There are seven different pen barrel colors (red, pink, white, yellow, green, blue, gray). A 3-Pack of these comfortable pens is currently on sale for just $19.99. You can also purchase a single pen online for just $4.50 from Amazon.com. 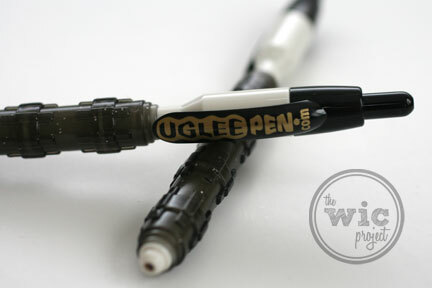 Refills for the the UGLee Pen are also available, making these an affordable writing tool option. One winner will receive an assortment of UGLee ergonomic pens! i learned that “it sort of sticks to your fingers without being sticky.” sounds interesting! I learned it takes years to build up the correct muscles for handwriting and that kids are at risk for repetitive stress injuries. I did not know children could have writing injuries. The UGLee pen is very comfortable and has perfect grip. I learned the ink used is a cross between a gel and a ballpoint, helping to create a smooth writing experience. I would love to win!! Uglees are so comfortable to write with. I like how its grip really molds to your hand to help cushion it. i remember in school i would always get this raw bump on my finger from writing so much and this would have been so much better! i like that it doesn’t cause your finger pain. comfort is redefined. This ergonomic pen is so comfortable that you will never want to use another grip pen again. The UGLee Pen was designed for every hand, from big to small. The pen only weighs 11 grams! I learned why it’s named Uglee, lol – and that it was invented by a doctor. The pen is easy and comfortable to use. It weighs just 11 ounces and can be used by a child. I would love to win this pen. I write all the time. It was developed by a real doctor and they have them for kids too. The overall shape are perfectly engineered to follow the anatomy of the hand. You don’t have to grip this material, it grips you. I learned it weighs 11 grams. I learned that they also have them for children! I learned that because of the pen’s unique design, you don’t have to rely on the muscles of your hand to grip the pen! Because of problems with my computer, I was unable to leave anything in the additional information fields. My twitter name is mrsjwilkerson and my email is [email protected]. Thanks! I learned Dr Lee has spent 8 years designing pens, before developing the Uglee pen! His wife must be very tolerating to have a garage of pen manufacturing materials! I learned you can purchase them right on their website! Designed by a real MD! 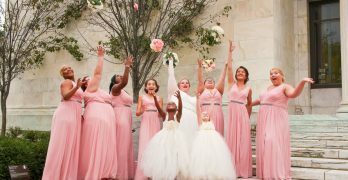 I learned that they come in a bunch of fabulous colors! I learnt that it provide best comfort. I learned that the pen grips to you not the other way around. I learned that Dr. Went asfar as to study the structure of the human hand using X-ray and researching the attachment and function of hand muscles to design the perfect grip. I learned that the UglyPen that is designed, created and used by a real physician. The shape of the pen follows the anatomy of your hand. The pens are made with the smoothest ink system know, which sounds great to me. I love it when a pen just glides effortlessly across the page. Kids are also at risk for repetitive stress injury, in fact that can be where it starts! Because of their underdeveloped muscles, it is easy for children to accumulate small injuries early. I learned it was designed, created and used by a real physician! I learned that it was created and used by a real physician! Made from ballistic grade nylon and designed by created by a physician. I learned that this pen is designed, created and used by a real physician! You can purchase them in black, blue or red ink. I learned that they are made to follow the anatomy of the hand & because of that it makes them more comfortable to hold. I learned that Uglee pens are great for children learning how to write!